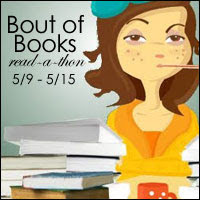 So over the past year I’ve periodically seen fellow bloggers participating in something called “Bout of Books” and reading their posts it has always seemed interesting/fun to me. So I decided to sign up for this coming one! I am excited to try it, though I’m still not 100% sure how it works. I do know that I’m supposed to read, which works out well for me since that is one of my favorite things to do! I plan to read at least 2 hours each day, with additional hours on the 2/3 days I am home during the week. Also the Saturday during Bout of Books is Goal Day for me so I can read all day (approx. 8 hours). My goals for this read-a-thon are pretty much to learn the ropes. I’d like to participate in as much as I can: the daily posts plus reading every day plus whatever else there is (if there is anything else?). SO! That is Bout of Books and that is my plan! I am really looking forward to participating, it lined up perfectly with my busiest ARC month to date so I am really appreciative of the extra encouraged reading time!!! Hope you guys check it out and join up! If you do want to join make sure to add yourself to the page’s Sign Up Post by Tuesday, May 10th at 11:59pm! Happy reading!